Foley Engines has been in business for more than 100 years. We are now in our third generation of hands-on family management. Because we are a customer focused family business we understand your needs and work hard to provide an exceptional customer service experience. We have grown our company by focusing on people who want their engine parts distributor to do more: to stock more heavily, to ship more quickly, to do more development, to do more supply chain management, to offer more flexible solutions, etc. In short, we want to have a relationship with our customers – a quality, long lasting relationship. Not just a series of one-time transactions. To build these relationships, we are committed to the values that have made us successful over the last 103 years. These include having knowledgeable people giving good customer service backed up by huge inventories and discount pricing with quick shipping. In short, giving good value. Our 20,000 square foot facility is located on Interstate 290 in Worcester, Massachusetts, the second largest city in New England. Fully 80% of the 7,000,000 people of New England are within an hour's drive of us. In a hurry for your parts? We are located next to a major U.S. Postal Center and are within 2 miles of a regional UPS hub. As a result we get multiple pickups all day long. Given our background and record of re-investing in our family business, we can take the long view and prepare for the future. Standing by, ready to help you. We are good corporate citizens and support local non-profit groups, offer student internships, and also support our industry. One of the ways that we add value is to have skilled, professional people on our team. Our people are engine pros with decades of engine industry experience. Many have been with us for over 20 years. We have noticed that other companies in the face of tough times have cut back on their staffing levels and training. We haven't. Our people have the latest in factory training, access to Deutz Serpic and Perkins SPI online catalogs, and other tools to help identify the parts you need. Our people have the technical and product knowledge that you won't find in a local parts store. The industry recognizes this and we are interviewed regularly by trade journals (such as Engine Professional, Construction Equipment Guide, Maine Coastal News, etc.) and regularly appear on national panels and forums. This is one of our strongest competitive advantages and it is a major benefit to you, our customer. This ensures that we meet your needs quickly with the right solution. The first time. For example, if you buy a Zenith carburetor or an exhaust purifier from us you're not just buying a carburetor or an exhaust purifier. You're buying a 103 year old company that is full of people who understand fuel systems and how they work and who can support that carburetor or purifier. We learn a lot from just listening. For example, when we learned that the manufacturer of belt drive governors was going out of business we sourced a universal belt drive governor. For people running gen sets we've developed an electronic governor package to replace their obsolete belt drives. When we learned from our overhaul kit customers customer that Deutz engines were great engines but complicated to rebuild we swung into action. We bought a truckload of engine cores and developed a remanufactured exchange program. 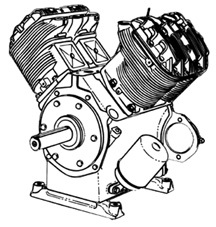 Now we can offer Deutz owners two options: complete overhaul parts kits and exchange engines. Finally, New England tree service companies were finding it difficult to purchase power takeoff clutches and clutch parts. So we became the authorized WPT Power distributor and now stock over 200 PTOs.